Financial reporting is a sobering issue. Creative accounting, “cooking the books,” earnings manipulations and other accounting shenanigans have been around as long as folks have had income, paid bills, taxes or sought investors for their ventures. With intent to defraud for economic gain and financial crimes, came the passage into law of the Sarbanes-Oxley Act of 2002 (Sarbox or SOX) that made the consequences of such behavior more than just a slap on the wrist. The 2000’s were to some companies public and private, financial reporting’s wild, wild, west. Exaggerations of earnings, fiduciary negligence and make-it-up-as-you-go nonchalance all contributed to the confidence of American investors being shaken to the roots. An overhaul of regulatory standards was needed to restore some measure of that confidence in U.S. public corporate financial reporting. Enacted in July 2002, Sarbanes-Oxley contains 11-sections or titles which detail corporate board responsibilities, penalties, rulings and requirements in complying with the law. Enhanced reporting requirements for financial transactions, including off-balance sheet reporting changes and the requirement that the Chief Executive Officer personally sign the company’s tax returns further focused the Federal Governments scrutiny on public company boards, management and public accounting firms. Is it a success? It is expensive to implement, and the jury may still be out on its overall value. There are three “sheets” in a financial statement: Income (or Profit and Loss), Balance and Cash Flow statements. As a package, they detail the financial condition of a business during a given time period. They also function as a tool to compare current financial information with a similar historic time period. They are useful to a lender or investor because, in addition to the information they contain, they follow, in certain forms, a standardized format known in the United States as GAAP or Generally Accepted Accounting Principles. GAAP comprises the rules and standards that accountants use in the preparation of financial statements. As of yet, there is no world standard although many countries are beginning to embrace International Financial Reporting Standards (IFRS) maintained by the International Accounting Standards Board. All European Union countries, Canada and Taiwan follow such standards. Companies report their results at regular intervals, usually quarterly. For those reporting on a fiscal year basis, the year usually starts at the beginning of a quarter such as April 1 or July 1 and ends one year later on the last day of the preceding quarter. For those that report on a calendar year, January 1 is the jump off with December 31 as the year end. Uncle Sam operates on the Federal Fiscal Year which runs from October 1 to September 30. This is, ostensibly, to allow time for the creation and submission of a budget by giving Congress time to seat new members and keep the business of government going. We all know how that has worked in the past few years. The Income Sheet is used to report all income and expenses relevant to the operation of the business for the purpose of generating income. It is also known as the profit and loss statement. It is formatted to include income, cost of goods, gross profit margin, operating expenses, net profit, depreciation, interest and taxes. The line items may change based on the nature of the business. EBITDA or earnings before interest, depreciation and amortization is computed from the items reported. It is a valuable tool in determining the capacity of a business to pay its obligations. There are two “sides” to a Balance Sheet, and both must balance out. One side summarizes the company’s assets, and the other side its liabilities during a reporting period. The difference between assets and liability is equity. Equity is the net worth of the company. Positive equity is good; negative equity is not. A Cash Flow Statement reports how changes in the Balance Sheet affect cash and cash equivalents. It breaks down operating costs, investing and financing to give a better picture of the short term financial health of a company, especially its ability to pay its bills. 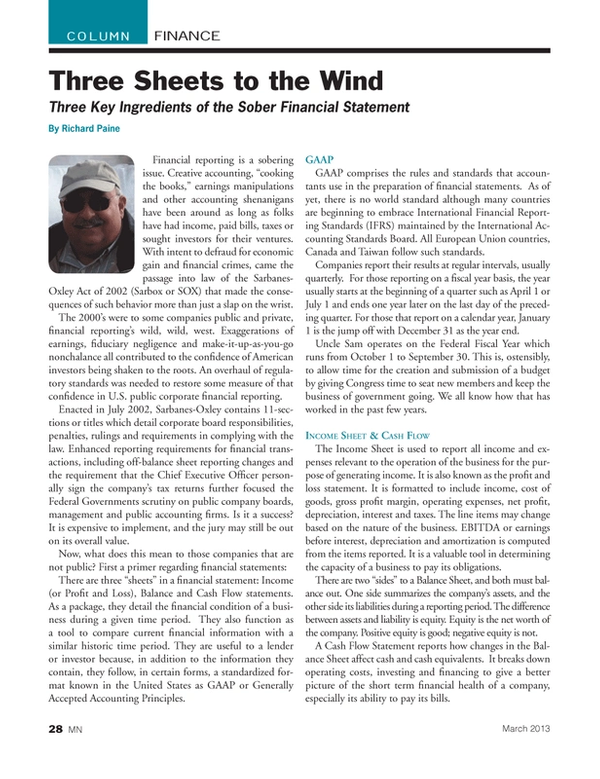 There are three “qualities” of financial statements: Compiled, Reviewed and Audited. Different factors dictate which level of quality is necessary as a reliable reporting tool. Client, lender or investor need, company size, revenue or type (the SEC requires that all public companies provide audited statements) all contributes to the level of quality required. Compiled statements require the accountant to have a working knowledge of the company and will draw the financial information for the statement from a general ledger. Documentation of entries is not specifically required and thus there is “no assurance” that the statements conform to generally accepted accounting principles. Reviewed statements offer “limited assurance” inasmuch as the accountant performs inquiry and analysis of the entries. Assurance is provided that conformity to generally accepted accounting principles has been demonstrated. Audited statements are the highest level of assurance providing all the steps performed in compilation and review plus verification of the entries in the statements. This is an extensive process which, in addition, is expensive. However, to a lender or investor, the high quality of the financial statements provided by the Certified Public Accountant is invaluable. From these statements, lenders and investors derive “key” financial ratios from the information being reported to determine the value and credit worthiness of the company. Creation of a code of ethics which informs employees and ownership alike of what behavior is and is not acceptable. An independent audit committee created and comprised partially of outside directors or those with financial expertise which may increase the value of lower quality statements. Assumption of personal responsibility by top management for financial reporting increases assurance to lenders and investors. A company that might be nearing an IPO or possible acquisition by a public entity may be more valuable because of selected SOX implementation. There is no doubt that more state and federal government regulation is headed towards both public and private businesses. Consult with your accountant or other legal or financial professional to discuss how this may impact your company.